In the first-ever fully dramatized STAR TREK audiobook, SPOCK vs. Q, Spock and Q go head-to-head over whether the Earth and humanity is worth saving from an impending asteroid. 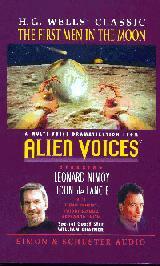 Both Nimoy and de Lancie use every personality trait in the characters they crafted to create a unique listening experience that is at times hilarious, at times intense, and above all compelling. 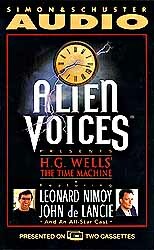 NEWS FLASH: John and Leonard have just finished working on "SPOCK VS Q" for their Alien Voices company. John de Lancie and Leonard Nimoy have signed a contract with Simon & Schuster Audio to produce their "Spock VS Q Armegeddon Tonight". 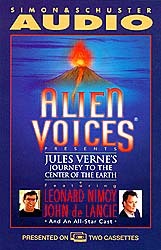 Alien Voices work has attracted such media groups as the Sci-Fi Channel, National Public Radio (NPR), New Line Television, Samuel French & Co., Dramatic Publishing, Rhino Home Video, and most recently the popular Internet group, Big Entertainment. Be on the look out for new productions soon!